Host giveaways quickly and easily! 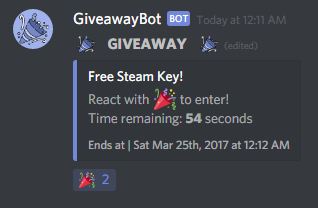 Hold giveaways quickly and easily on your Discord server! GiveawayBot is powered by JDA and JDA-Utilities. !gstart <time> [winners] [prize] - Starts a new giveaway in the current channel. Users can react with a 🎉 to enter the giveaway. The time can be in seconds, minutes, hours, or days. Specify the time unit with an “s”, “m”, “h”, or “d”, for example 30s or 2h. If you include a number of winners, it must be in the form #w, for example 2w or 5w. !greroll [messsageId] - Re-rolls a winner. If you provided a message ID, it rerolls the giveaway at that ID. If you leave it blank, it looks in the current channel for the most recent giveaway and rerolls from that. !gend [messageId] - Ends a giveaway immediately. If you provided a message ID it will end the giveaway at that ID. If you leave it blank, it looks in the current channel for the most recent giveaway and ends that. !glist - Lists currently-running giveaways on the server.